The phonebook displays all the contacts in a list ordered alphabetically and there is an alphabet scroll on the right. There’s also a regular search bar. The list can be sorted by first or last name and you can choose how contacts are displayed – First Name, Last Name or vice versa. Filters keep the phone book from getting overcrowded – you can choose which groups are displayed and which are hidden (e.g. Family, email contacts, and so on). Each contact is displayed with a contact photo and name – a tap on the photo brings up the quick contacts keys. You can use those to call the contact, send them a message or email or view their profile. Viewing a single contact uses a tabbed interface. The first tab is Info – and it shows all available info for the contact with handy one-tap shortcuts for calling, messaging and so on. The next tab is History, which shows the communication history with the contact (calls, SNS updates, everything). The final tab is Photos which show the contacts online albums. You can join contacts so that if you have a contact added to multiple services, all the data from them is pooled in one place. When you tap Join, the phonebook will suggest a contact based on name and it’s right most of the time. You can manually pick another one if it’s wrong of course. When you add a new account, the phone will offer to import all, only some of the contacts or only those it already has in the phonebook. Editing a contact is mostly unchanged. You have all the types listed (numbers, email addresses, etc) and there's a plus sign on the right - clicking it adds another item of that type. Pressing the minus sign under it deletes unneeded info. The Call log is clever and groups some of the calls, e.g. 3 missed calls from the same contact on the same day. A number next to the contact name shows the number of events. It’s a great space saving feature. The Dialer shows a virtual phone keypad that lets you dial a number. Smart Dial is available and works like a charm – it searches both numbers and names. Only one matching contact is displayed, but if you tap the down arrow button, the rest show up as well. We found no issues with the reception and the in-call quality of the LG Nitro HD. The phone performed with no fuss in the New York City area. 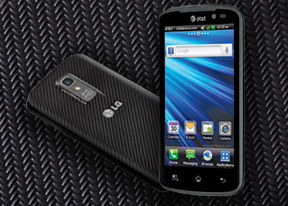 The LG Nitro HD can handle all common types of messages with ease - SMS, MMS and email. Email support is excellent with support for Exchange out of the box and social media buffs will be pleased with the level of integration of that content as well. The Gmail app supports batch operations, which allows multiple emails to be archived, labeled or deleted. Multiple Gmail accounts are also supported. The generic email client supports multiple accounts. If you do add multiple accounts, then the Combined Inbox feature will come in handy. The LG Nitro HD offers you two virtual keyboard options out of the box. Along with the standard Android keyboard, you can also use LG’s own virtual QWERTY. Both are easy to use on the giant screen of the device. In case they don’t cut it for you, feel free to head over to the Android Market for more options.